This is the Microsoft patch overview for August, 2015. It reviews all security and non-security patches that the company has made available for its Windows operating system and other company products. The overview provides you with details and links to all patch notes and knowledge base articles that provide additional information about each update. It begins with an executive summary listing the most important information about this month's patch day. This is followed by operating system and Microsoft product distribution information listing severity information and security bulletins for each product. The next three chapters, security bulletins, security advisories and updates, and non-security patches, list all patches with descriptions and links to Microsoft resources. The last chapter lists download and deployment information, and links to important resources. Microsoft released a total of 14 security bulletins on the August 2015 patch day. Three bulletins have been classified with the severity rating critical, the highest level. All client and server versions of Windows are affected by at least one bulletin with the highest severity rating of critical. Other Microsoft software affected by vulnerabilities this month includes Microsoft Office, Microsoft SharePoint, Silverlight and Lync. Windows 10, Microsoft's new operating system, is the only system affected by three critical vulnerabilities while the remaining systems are affected by one or two only. The bulletin exclusive to Windows 10 is MS15-091, a cumulative security update for Microsoft Edge. 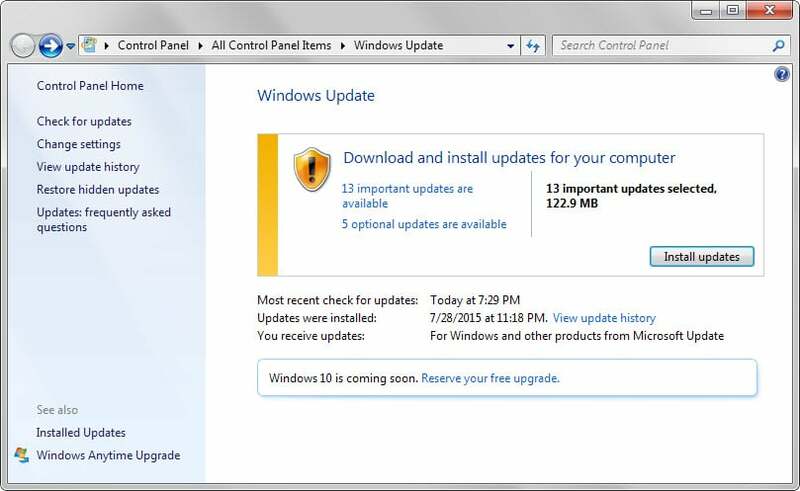 All security updates are available via Windows Update. Most Windows users have automatic updates enabled which means that the operating system will pick them up automatically to install them on the system. Since there is a delay between checks, it is advised to run a manual check for updates instead if updates need to be installed as soon as they become available. Tap on the Windows-key, type Windows Update and select the appropriate option from the search results. Windows will run a manual check for updates and display all that are compatible with the system. All updates are also made available as individual downloads on Microsoft's Download Center website. From there you may download a monthly security ISO image also which contains all patches for the month for all supported systems. If you prefer third-party tools to download patches, check out the Windows update guide in the additional information section below. This is a detailed overview of Microsoft's August 2015 patch day for Windows and other company products.